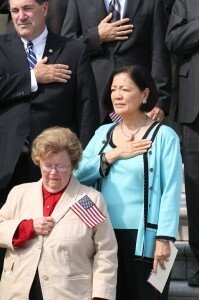 Sen. Mazie Hirono at the 9/11 commemoration on Capitol Hill. Sen. Mazie Hirono (D-Hawaii): “Twelve years after the Sept. 11 attacks against our nation, the memory and pain of that day is still very fresh. Like many in Hawaii, I remember hearing about the attacks that morning and being deeply moved by stories of first responders who flooded into the burning buildings, families searching frantically for missing relatives and regular people on the street who banded together to help the search and rescue efforts. Rep. Doris Matsui (D-Sacramento): “Today we honor and remember all of those who tragically lost their lives in the terrorist attacks 12 years ago on Sept. 11. We will never forget that day of sorrow, and our thoughts and prayers remain with the families and loved ones who were left behind. “This anniversary is not only a day of sorrow, however; it is also a time to honor the heroism and selflessness that was on display that fateful day. First responders, unflinching in the face of terror, worked selflessly to save American lives. Ordinary citizens displayed uncommon courage, helping their fellow Americans to safety. Rep. Colleen Hanabusa (D-Hawaii): “As we pause to remember the devastating events that shook our nation 12 years ago today, I will recall the tremendous bravery and commitment of the men and women who faced the challenge and fought to save those in danger. We must continue to honor those extraordinary Americans we lost in the attacks and in war, including those with ties to our beloved Hawaii, and forever keep them and their families in our hearts. Rep. Tulsi Gabbard (D-Hawaii): “Today marks 12 years since our country experienced a horrific attack on U.S. soil. We remember the many Americans who lost their lives in this attack. We honor the courage of our servicemembers and their families who have sacrificed greatly in the fight against al-Qaeda, and in the service of our nation. Rep. Tammy Duckworth (D-Ill.): “We must remember those who lost their lives and sacrificed so much on Sept. 11, 2001. The attacks on the World Trade Center, the Pentagon and the hijacking of Flight 93 were not only horrifying but also a reminder of the challenges we face as a free nation. We must also remember those who showed enormous resilience and courage. Whether it was the firefighters and police running into the World Trade Center, the heroes of Flight 93 or the American people standing together as one, our response to 9/11 truly reflected the American spirit.